The new church was built in only 3 years based on the project of the architect Elia Fornoni who thought of it in Gothic style in three naves, according to the customs of the time; it was consecrated on 22nd November 1896 by Bishop Guindani and devoted to Saint John Baptist. The spired portals on the facade are made of marble from Carrara on a plinth of granite from Montorfano and the marble statue of the patron saint was carved by the Novarese sculptor Francesco Albera. The graceful inside presents eight pillars on a marble plinth of Virle Treponti, from which the numerous archs and ribs arise, supporting the vaults. On the right wall you can admire the two most valuable paintings: a Nativity of the early sixteenth century, with the peculiar later inclusion of a very beautifully painted sheppard and the Virgin with the saints Anthony, Panthaleon and Mary Magdalene with two pupils, exquisitely painted by Carlo Ceresa (1609 - 1679). The major altar is a magnificent example of marble inlaying of the seventeenth-eighteenth century which was tranferred from the old church. 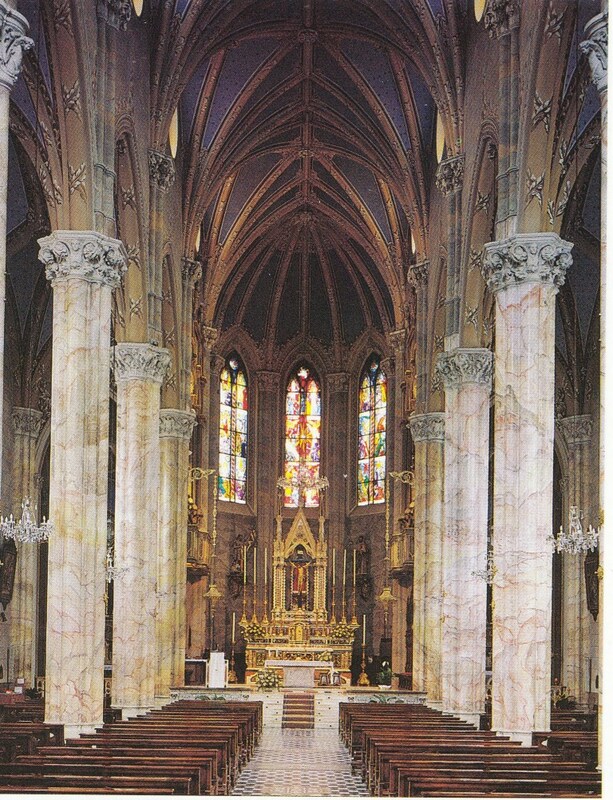 In 1890 the marble altar was enlarged by the firm Giovanni Fossati and Cesare De Vecchi in Bergamo. 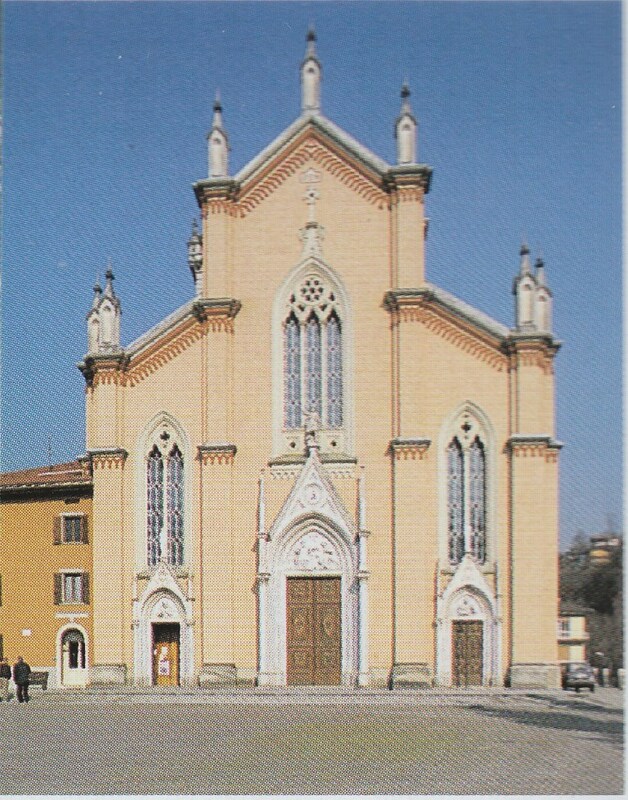 The Gothic-style apse, with its slim twisted columns, was executed in 1914 by Guglielmo Tonus based on Fornoni’s drawings, just like the balustrade and the monolithic screen. In 1968 the presbytery was reassembled by the firm Carlo Comana in collaboration with the sculptor Ferruccio Guidotti for the relief of the Supper in Emmaus on the altar, according to the new liturgic needs. The statues of Saint Joseph and Saint John Baptist in the apse were carved by Francesco Albera (1888); the statue of Saint Luis is dated 1912; the Virgin of the Rosary, instead, was carved by Giovanni Avogadri in 1937. Among the carved vestments and vessels you can admire a confessional for women dated 1680, the pulpit dated 1861 and executed by two artists: Bettinelli Cristoforo from Bergamo and Carminati who completed it in 1888. The organ is a Luigi Balicco Bossi dated 1810, renewed by the Piccinelli from Ponteranica in 1920 and restored in 1993. The old steeple was demolished in 1820 for its excessive gradient; the steeple which replaced it was in turn pulled down after the current one was finished in 1907 and designed again by Fornoni. The Sanctuary in Brembilla, the Scurolo. 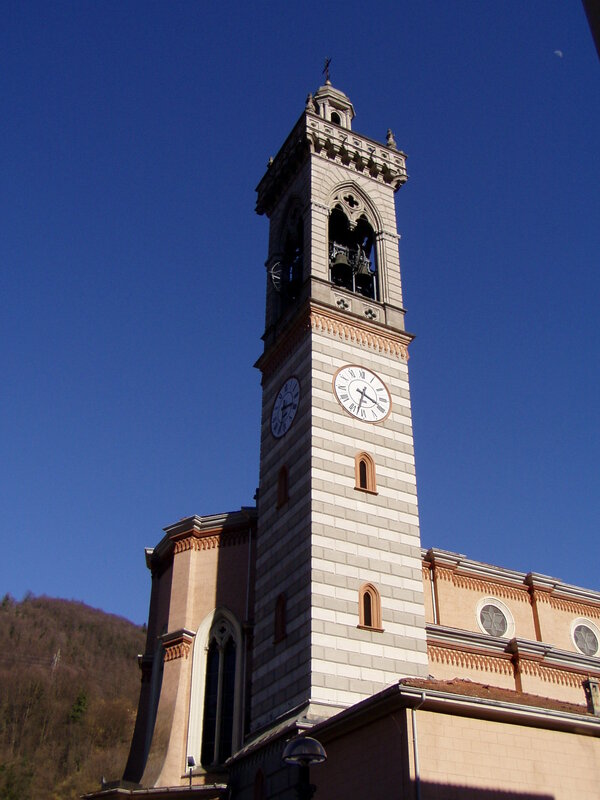 It is a cosy and beautiful church, devoted to the Virgin of Lourdes, whose cave is reproduced, it is the Scurolo lying below the parish church. It was built together with the church, drawn from the crypt, lying below the presbytery. It is a real small church with three small naves. Unfortunately, due to work being carried out, pictures are not available.